A delightfully unique Cafe and Bistro, Martha’s Leelanau Table can be best described as a European-style cafe where every entree is made from scratch. Regional cuisine is the theme, and every dish is also made from the very finest ingredients available in Leelanau County and the surrounding region. We source the leading local farms in the farm-to-table movement, and the difference is evident in our delicious offerings. Twice a year, Martha leads tours to Europe and the culinary experiences of her travels are directly reflected in the ever-changing menu. 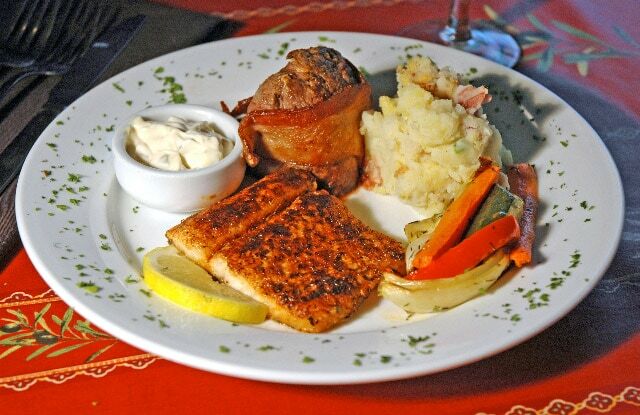 Daily specials are created from foods currently available in-season (perch, walleye, salmon, fruits and vegetables) with a variety of comfort food dishes in other seasons. 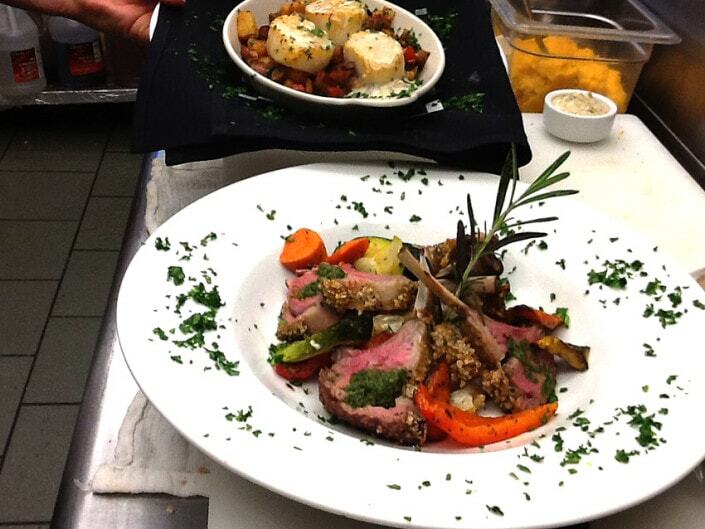 Because everything is made from the freshest ingredients available locally, our menu can change on a daily basis. Please call ahead if you have particular questions about menu items. We happily accommodate gluten-free diners and feature a number of GF menu items everyday. Located in the red house in downtown Suttons Bay (413 North St. Joseph Street), Martha’s has become a favorite gathering spot for friends, family, visitors, and regulars alike. Martha’s features breakfast, lunch and dinner, plus a full espresso bar, beer, wine and cocktails. Breakfast is always simple, and it’s always fresh, with local eggs (poached, scrambled, or any way you like them), crusty bread toasted and served with strawberry jam, and buttermilk pancakes with blueberries and Michigan maple syrup. Lunch – 11-3 PM Lunch might be a steaming bowl of classic pistou, a crusty sandwich piled high with meats and cheeses,Tex-Mex Salad Bowl, Land of Delight, and Santa Fe Club. But no matter the entrée, it’s always made from scratch and of the finest local ingredients. Dinner at Martha’s is a Farm-to-Table culinary experience. It begins with Martha’s famous Jumbo Lump Crab Cakes or perhaps Leelanau Raclette with roasted potatoes & cornichon among many other delightful starters. Entrees change frequently and range from Bacon Wrapped Walleye, many saltwater and freshwater entrees, to Venison Osso Bucco Seasonal Local Whitefish. Our pastry chef offers several creative desserts, many of them gluten free, using fresh, in-season fruits from the surrounding orchards and farms. Call 231-271-2344 for reservations or online at Ureserv. Walk-ins welcome. 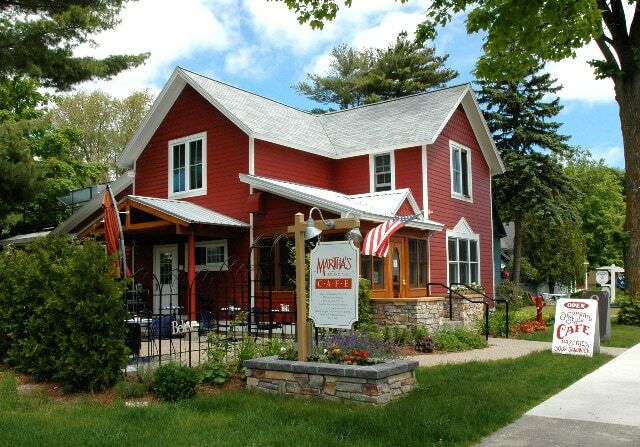 Since opening over ten years ago, Martha’s has become a “must visit” restaurant among the wonderful variety of dining establishments we enjoy here in Leelanau County. Please plan to join us when visiting our region. We truly hope to see you soon! Join Martha on one of her Food and Wine tours of the World. Next up is a 12 Day Trip to Quebec and Nova Scotia in the Spring of 2019. For more details contact Martha at the restaurant at (231)271-2344 or online at marthasleelanautable.com.